Our Farmhouse Le Vigne lies where nature and historical cities merge together, in the heart of Tuscany, very close to Florence. 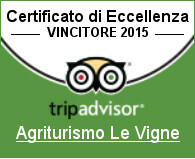 It is located on the Pistoia hills, surrounded by silence, olive groves, vineyards and woods. The farmhouse is a family run business, managed by me, Andrea, and my daughter Ylenia. We were born and grew up on the Pistoia countryside and we commit ourselves daily to convey to our guests passion and respect for our land, as we feel it is a fundamental part of our lives and a common good. In our Farmhouse we carry out two types of breeding: the Cinta Senese pigs and the Chianina cows according to the criterion of short chain. We participate to the national project: “CAMPAGNA AMICA” that promotes and supports Italian agriculture through direct sales from producer to consumer, therefore local products, thus ensuring the sale of products from Tuscany and exclusively produced by ourselves or neighboring farms in Pistoia.. 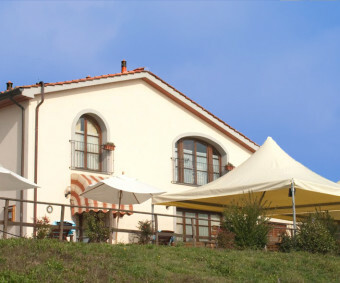 In our restaurant you can taste the traditional dishes of typical Tuscan specialties with Cinta Senese and Chianina meat; this way we tell, also through our food, the flavors and aromas of our fields and our territory. We offer you 4 comfortable double rooms equipped with every comfort. We also have a small play area for children and a relaxation area, equipped with umbrellas and sun beds, great place to read a book, sip an aperitif or for pleasant moments of relaxation. … maybe it’s all of these things, or perhaps, more than our jobs, it is Our Life. Whenever you need it we will be at your disposal, but if you come to visit us while we are working in the fields and taking care of our animals, it will be our pleasure to introduce you to our world. See you there!